This religious wall tapestry "Madonna della Pappa" shows the work of Paolo Veronese (1528 – 1588). Also known as the holy family, this work was originally a fresco painting by this high Renaissance painter. Veronese was the son of a stone cutter and as a youth in Venice, his talents as a painter became apparent, with his skills surpassing his teachers at age 15. He has produced many large colorful works of a religious nature. Here we see the Holy family with haloes around their heads to signify their pure aura as well as a helper. There is a lightness of touch in this work in both the use of color as well as a sense of carefree movement in the subjects that is unique, to create a feeling that this was a moment that impromptu captured in a moment in time. 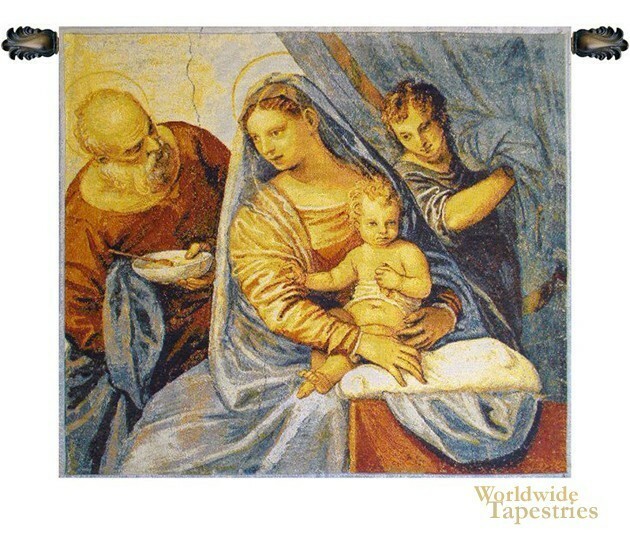 This religious art tapestry "Madonna della Pappa" is lined and has a tunnel for easy hanging. Note: tapestry rod and tassels, where pictured, are purchased separately.